Princecraft, for decades the largest Canadian manufacturer of aluminum boats, offers dozens of models within several series in three main categories; fishing boats, pontoon boats, and deck boats. 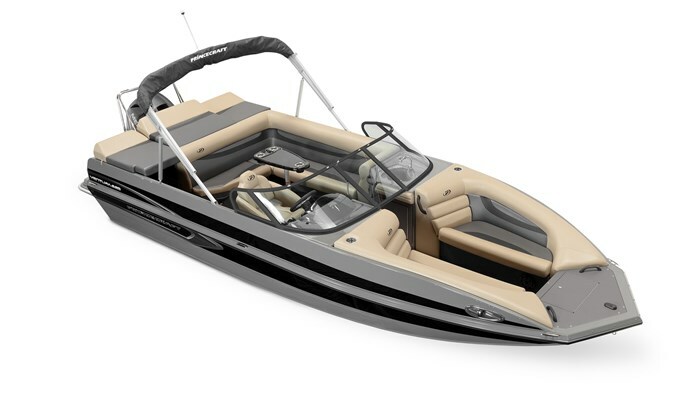 The Ventura 220 WS is one of six deck boat models from nineteen to twenty-two feet and is the only one with a full, five-piece, walk-thru windshield (WS) with centre opening section. 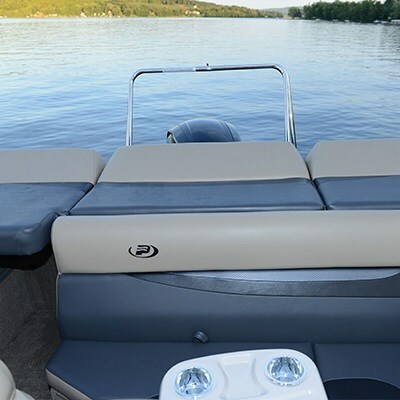 Even though the Ventura 220 WS is essentially a deck boat, the full-width windshield requires that it have both a driver and a passenger console and so the interior layout appears just like any recognizable bowrider. 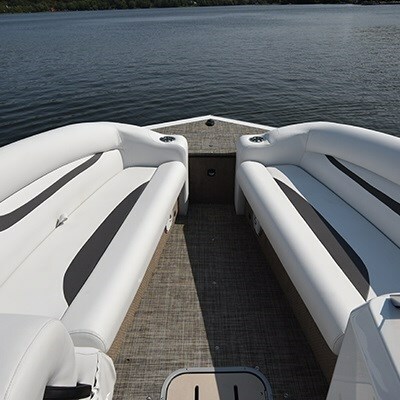 Instead of the driver’s single side console layout like the balance of Princecraft’s deck boats, the full windshield design of this particular model provides substantially increased weather protection for passengers. A hinged flip-up cushion on the starboard side of and forming part of a full-width single or cozy double-wide transom sunpad allows walk-thru access to the cockpit from the integrated but relatively small swim step with standard flip-up boarding ladder. A similar platform on the port side of the transom is accessible from over the top of the sunpad. A flip-up cushion on that side provides access to the storage compartment within. 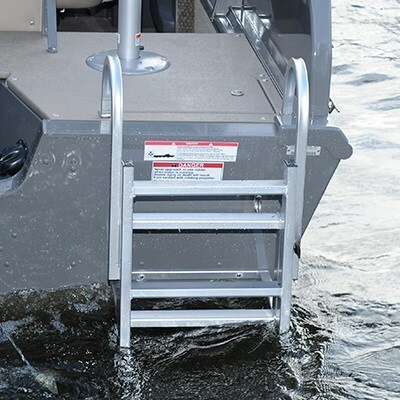 A pair of optional add-on swim steps, the starboard one with its own flip-down ladder, will really enhance watersports accessibility and enjoyment. An L-shaped lounge with full padded and upholstered backrest stretches from this starboard side transom walk-thru fully across the transom and forward along the port side right to the passenger console where the backrest curves in front of this console to facilitate aft-facing lounging. A pedestal mount removable snack table with molded-in drinkholders serves this lounge. Storage is found beneath all bench and lounge seating. Two facing lounges with full surrounding high-back backrests on three sides fill the bow seating area. The ends of these two lounge seats that abut the two consoles are slanted and contoured to comfortably promote forward-facing stretch-out lounging. A large anchor locker fills the raised foredeck. A Roto-Cast driver’s swivel bucket seat with slider faces a sport tilt wheel with Sea Star hydraulic steering and a very modern yet practical black thermoformed dash with tachometer, speedometer, trim, volt, and fuel gauges plus a 12-volt power outlet. A 160-watt Jensen AM/FM Bluetooth-compatible stereo with four speakers is standard. The passenger console is unique in that it features an integrated ice chest. Storage within both consoles is accessed through doors within the windshield walk-thru section. In the floor of this walk-thru is a large and lockable storage compartment suitable for watersports accessories such as waterskis and wakeboards. 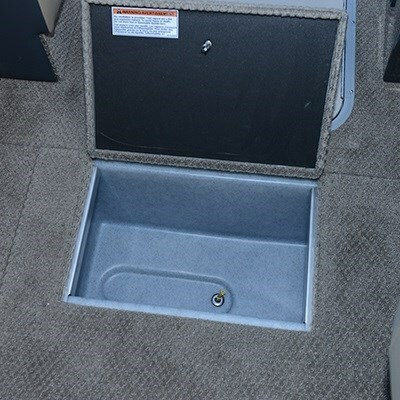 A unique in-floor dedicated cooler is located immediately aft of the in-floor storage compartment. Twenty-ounce carpet is the standard floor covering in the Ventura 220 WS. You may optionally choose anti-skid vinyl or Teak Supreme Solid grey vinyl. 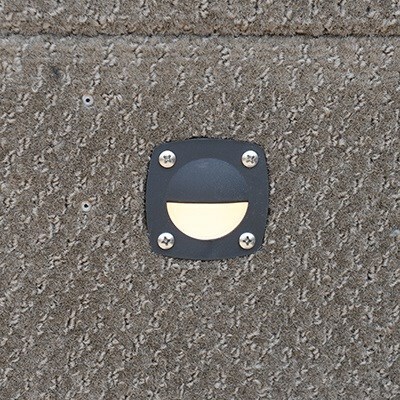 There are two standard hull colours; Magnetic Grey or White that appear above and below the standard narrow horizontal hull graphics bordering the rub rail. A colour co-ordinated convertible buggy bimini top is standard. You now have forty-four options within seven categories from which to choose. Your first choice will be which Mercury outboard in 150, 175, or 200 horsepower will be best for your boating enjoyment. You may then want to add Mercury or Panther XPS power steering to your standard hydraulic steering. The Mercury SmartCraft™ gauge upgrade would be a smart choice as would Mercury Active Trim. You may also choose the unique sink and faucet upgrade to the passenger console. An anodized wakeboard tower is available as is a forward flip-up bolster for the driver’s seat. You may want underwater lighting and docking lights as well. You can get a pop-up privacy enclosure that stores in the starboard transom walk-thru and to which you can add a toilet with holding tank. 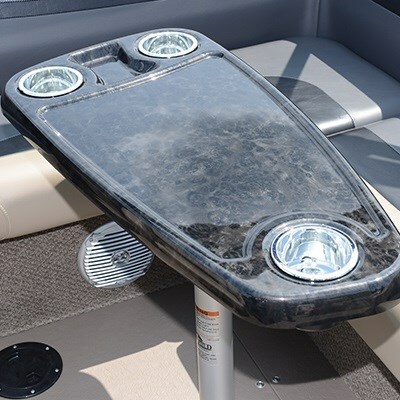 You will probably want the stainless steel waterski tow bar, perhaps the unique dual-purpose inflatable bow filler cushion, a pedestal mount bow table, and a driver’s side windshield wiper. A mooring cover and trailering cover are both available and unique to the Ventura 220 WS as opposed to most “bowriders,” not only a camper back but also a camper front with full enclosures! What a practical addition to enhance your boating enjoyment. All canvas is available in Taupe or Black. A tandem-axle black painted or galvanized trailer is available along with several cosmetic and/or practical upgrades. 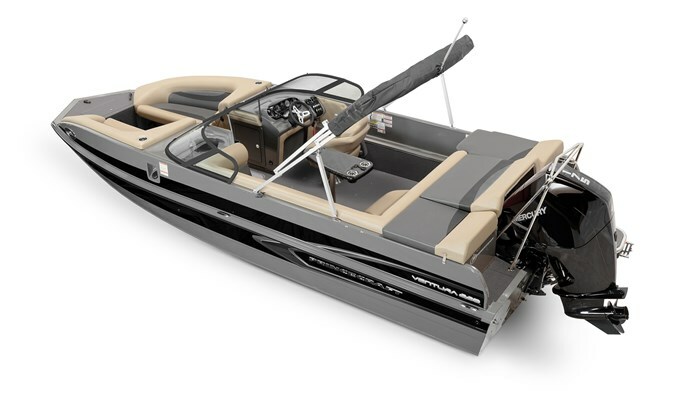 The Princecraft Ventura 220 WS Deck Boat is Canadian made and outfitted to maximize your watersports and cruising enjoyment on our incredible Canadian waterways.